1. Introduction. 2. The Nature and Function of Theories. 3. Development of Theories of Development. 4. The Information-Processing Framework. 5. Experience and Expertise. 6. General Methodological Issues. 7. 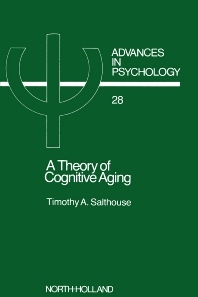 Requirements of a Cognitive Aging Theory. 8. The Speed Factor in Cognition. 9. The Speed Factor in Cognitive Aging. 10. The Processing Rate Theory of Cognitive Aging. 11. Memory Abilities. 12. Perceptual-Spatial Abilities. 13. Reasoning Abilities. 14. Implications and Future Directions. References. Index. Over a half-century of research has documented the fact that people of different ages perform at different levels on a variety of tests of cognitive functioning, and yet there are still no comprehensive theories to account for these phenomena. A Theory of Cognitive Aging is intended to begin intellectual discussion in this area by identifying major issues of controversy, and proposing a particular theoretical interpretation based on the notion that the rate of processing information slows down with increased age. Although still quite preliminary, the theoretical perspective is demonstrated to provide a plausible account for age-related differences in functioning on measures of memory, spatial ability and reasoning. To advocate a more explicitly theoretical approach to research in the area of cognitive aging. To outline three important dimensions along which it is argued that any theory of cognitive aging phenomena must take a position. To evaluate empirical evidence relevant to specific positions along those dimensions. To summarize the major concepts of the current theory, and to describe its application to selected findings in the research literature.